The good news is that, you can now download and install LineageOS 16 for Galaxy J7 2016. Here is how to install LineageOS 16 on Galaxy J7 and update it to Android Pie with a step-by-step guide. This build of LineageOS 16 for Galaxy J7 2016 is brought to you by developer Abhayruparel and another build by Karthik1731. THIS IS AN INITIAL BUILD OF Galaxy J7 2016 LineageOS 16 WHICH MAY NOT BOOT AT ALL OR EVEN IF IT BOOTS IT MAY HAVE MANY BUGS. Installing a TWRP recovery on Galaxy J7 2016 may delete all your data. Before proceeding further you may consider backup all data on the phone. Download and Copy the LineageOS 16 Gapps and the Galaxy J7 2016 LineageOS 16 ROM ZIP file to your phone. Boot into the TWRP custom Recovery to install this LineageOS 16 for Galaxy J7 2016. Install the Galaxy J7 2016 LineageOS 16 ROM file that you have copied into the phone. Reboot and Enjoy the Galaxy J7 2016 LineageOS 16 Android 9 Pie ROM. 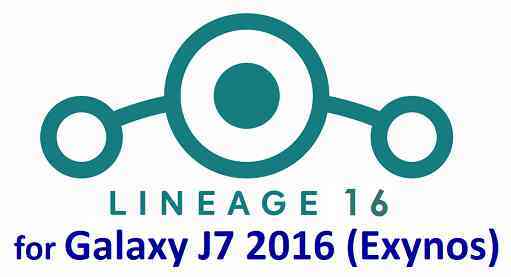 Install the LineageOS 16 ROM for Galaxy J7 2016. If you don’t have GApps after upgrading the LineageOS 16 on Galaxy J7 2016, then flash the GApps. If you don’t have ROOT after upgrading the LineageOS 16 on Galaxy J7 2016, then flash the SuperSU or Magisk or the Lineage SU binary. Once everything is done, reboot and Enjoy the LineageOS 16 for Galaxy J7 2016. Complete the initial setup and enjoy Android 9 Pie with LineageOS 16 on Galaxy J7 2016. Stay tuned or Subscribe to the Galaxy J7 2016 (j7xelte) LineageOS forum For other Android Pie, Android Oreo ROMs, Nougat ROMs, or other ROMs and all other device specific topics. My phone boots,samsung logo shows up couple of seconds and pass and then nothing,the screen turns black and it never turns on. Can someone help? I think there is no OS present on the phone. It is just the bootloader comes up and finds nothing to boot and goes down. Can you reflash this ROM or any other ROM or stock firmware on your Galaxy J7 2016 and see if it boots? I think there is no OS present on the phone. It is just the bootloader comes up and finds nothing to boot and goes down. Can you reflash this ROM or any other ROM or stock firmware on your Galaxy J7 2016 and see if it boots? Edit: The dev Karthik1731 in XDA FORUMS develop a Unofficial ROM that seems able to be a daily use. Just check it out!!! Hi, In J710MN, it installs the system in twrp, but when it restarts, after the ‘J7 METAL’ screen it turns off and does not install. I already used lineageos 15.1. I have added his build to the Download list.